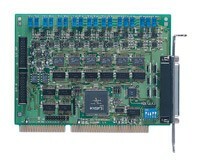 ADLINK's ACL-6126 is a 6-CH, 12-bit analog output card. The voltage output function provides voltage outputs in ranges of ? ?5 V, ? ?10 V, and accepts external voltage reference for multiplying analog output applications. The current output function provides current loops in ranges of 4 to 20 mA, and accepts external power from 8 to 36 V. In addition to the analog output functionalities, the ACL-6126 also features 16-CH TTL digital inputs and 16-CH TTL digital outputs, and further expands the application coverage. ADLINK ACL-6126 delivers cost-effective and reliable analog output functionalities for ATE, signal generation and other industrial control applications.